The BodyGuard T240 treadmill is arguably the best China made treadmill in the market today. Unlike other Chinese assembled exercise equipment, this one provides great value with its excellent quality and long warranties. If you are looking for a treadmill in the $2,000 price range, then you should really take a closer look at this one. At its price, this unit would be extremely hard to beat. The quality and warranty that this treadmill offers is probably the best in this price range. It is even better than some more expensive models. The BodyGuard T240 treadmill possesses a 2.75 HP (DC) motor with speeds that ranges from 0.5-10mph. It can also be inclined to up to 15% which is perfect for those who love to run uphill. These features give you the flexibility in your workouts. The LED mono colored central information window with a 12 digit scrolling screen shows you necessary information regarding your workout. While the silicone keys provide users a soft touch feel. You can also set to Spanish, French or English the language to be used. The 22” x 57” tread belt is big enough to give you room to run with ease during your workout. The BDS cushioning prevents accidents by reducing impact and minimizing lateral movement while at the same time increasing comfort for a healthier, longer run. The BodyGuard T240 treadmill also comes with 9 programs list. These help keep your routine fresh so that your body won’t adapt to your usual exercise and your progress will continue. Also included is the JustGo button which is their quick start feature. It jump starts your workout without having to input your information. This function is perfect for people in a hurry. 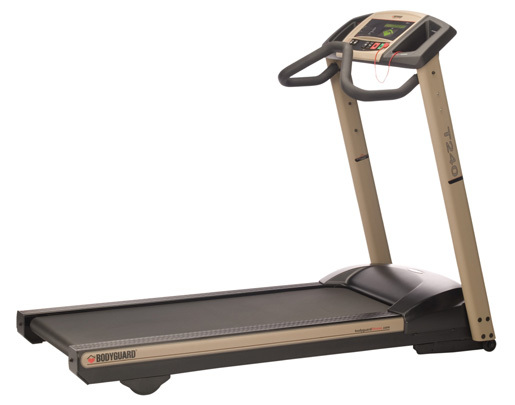 Other features include the advance friction detection system (AFDS) which prevents overheating of the motor and shortage of the drive and the electronic stride control (ESC) which controls the speed of the machine to prevent it from suddenly changing pace especially when the treadmill is inclined. And finally, the T240 boasts a lifetime warranty for its motor and frame, a 10 year warranty for its parts and wear and tear, and a 3 year labor warranty. These warranties are hard to beat especially since this is only a mid-priced treadmill. It simply shows how confident BodyGuard is with their product’s quality. The only weakness I see with this unit is that its heart rate monitor costs extra. Most $2,000 treadmills from other companies already includes this feature. But other than that, I don’t see any other reason why you shouldn’t buy this machine. The BodyGuard T240 treadmill is highly recommended. It is probably the best $2,000 treadmill in the market right now. However, if the price is beyond your budget then I suggest you visit our Best Buy Treadmills page and find a machine that suits you best. Belt Size: 22" x 57"
If you plan on buying a BodyGuard T240 treadmill, I suggest you find a local dealer through bodyguardfitness.com. It is normally sold for $1,999.00. Do You Think This Treadmill is Worth Buying? After reading this article, do you think buyers should purchase this treadmill? Share your opinion with other visitors of this site by writing your own review. It's free, fun and easy to do. Everyone is invited to join in. Reminder: This site would no longer publish reviews that doesn't provide any real value to other consumers. Your contribution will appear on a Web page exactly the way you enter it here. (although I do reserve the right to edit, update, delete any submissions) You can wrap a word in square brackets to make it appear bold. For example [my story] would show as my story on the Web page containing your story. Do you have a picture to add? Great! Click the button and find it on your computer. Then select it. Adding a picture is an excellent way to increase your credibility and keep your readers interested. This article helps. I'm looking into this treadmill now.